There's something for every budget from luxury hotels through to hostels and the fun of camping. The place to find useful information on travel, tourist information, and everything else about the Lakes. This is a guide to the cafes and bars that offer something a little special or unusual in the Lake District. We've included all kinds of places, all kinds of choices, and all of price ranges. The one thing that all these places have in common is that they offer tasty eating, a pleasant environment, and value for money. If you've enjoyed a cafe or bar and you'd like us to review it, send your comments and observations (good or bad) to info@lake-district-guides.co.uk. You can get to Sizergh farm shop and cafe from the main road from the M6 to Kendal, or from the road that goes to Sizergh Castle. It's a wonderful and very imaginative development which has produced some award-winning food, ice cream and food over the years. We called in for lunch on our way to the Lake District, and had a simply excellent quiche and salad, although the meals on offer are much more extensive than this selection of ours might lead you to believe. The friendly staff know exactly what they're doing, the environment is superb, and the standards are very high – not just in terms of the food quality, but also in terms of service, cleanliness and willingness to help. Downstairs there's an organic food shop, featuring a fantastic range of cheeses amongst other things of course, and a wonderful shop where you can buy all manner of gifts and good quality clothing. Part of the profits of this organisation go to a mental health charity, so it's well worth supporting. Sizergh is a great place to stop on your way into the Lake District if you're arriving late afternoon for tea, or at lunchtime for food to sustain you until you've arrived at your destination. It's highly recommended, never disappoints, and over the years that we've been going there, we've found constant innovation and a forward-looking attitude that really energises the place with an exciting vibe. We recommend the tea shop at Brantwood, the home of John Ruskin on the shores of Coniston. We called in there after a day looking round Coniston village and Brantwood, and thoroughly enjoyed our cream tea, and cake. A pleasant environment indeed, served by very friendly and helpful staff, this was a warm oasis on a wet windy day. There's a terrace outside the cafe overlooking the grounds leading down to the lake, which will be absolutely delightful in summer. It's wonderful that England has seen such a renaissance of catering in recent years, and nowhere is this epitomised more clearly than in Brantwood's cafe. Full marks to the John Ruskin trust for providing such a wonderful cafe. Holland's cafe is an interesting place in Coniston village – it offers boutique accommodation, and a fine range of food all day. Holland's is highly recommended by others for a famous all day breakfast, although we can't vouch for this because we called in for morning coffee. We can tell you is that the coffee was fabulous, and this pleasant cafe is in a delightful location just outside the centre of the village, and the friendly staff are eager to help; best of all, the coffee and food are wonderful. We enjoyed a courgette cake which was one of the most moist and delicious cakes we've had in quite some time. It wasn't very busy at the time we called, although this was a wet and windy day in summer, so it's possible that everybody was indoors in their holiday accommodation. We also called back later for lunch, and we can highly recommend the food served at lunchtime as well. All in all, this is a cafe that stands out, a modern British cafe doing what it does very well, with the added bonus of boutique accommodation if you care to stay overnight. Full marks to the current generation of the Gillam family for revitalising a family business which had languished in recent years. It's now right back at the top of its game, with a massive range of excellent teas, coffees and superb organic food shop which offers you produce that generally would only find in big-city organic food shops, and a tearoom that is absolutely made in heaven. Although the concept of a tearoom might seem old-fashioned, there's a modernity about Gillam's which brings it bang up to date with excellent food, stylish service, and a menu that accommodates all tastes. That could account for the fact that the customers in the cafe when we called in was a mixture of what I would call traditional old-timers and more modern day tourists. A place which manages to bridge the gap between tradition and modernity so effectively as this deserves to be supported, and we are completely devoted to doing so – so much so, that every time we go to Ulverston we call in for tea and cake! You can also get more substantial fare there, so if you're looking for lunch or a late afternoon meal, try it out – one thing's for sure and that's simple: you'll be delighted with the standards of service, the food on offer, and the whole environment. Fantastic. Ripe deserves a mention, because it's one of the most fabulous forward-looking food projects in the southern Lake District – a bakery and food producer which uses only the best possible ingredients, with particular emphasis on health. It had to happen, and Ulverston is a great place for it to have happened – it being a switch from stodgy British food. Ripe uses only the best ingredients to make light modern food that's healthy and utterly delicious. Ella deserves full credit for her venture here, and the fact that she is now being supported by high quality places like Chester's at Skelwith Bridge demonstrates the quality of her ingredients. Visit her website to find out opening hours and exactly what she can do for you in terms of food. Really, if you're enjoying a holiday in the beautiful scenery of Lake District you might as well complement that with the best possible food you can get – and here's a place where that becomes not only possible, but actually absolutely enthralling. The raw chocolate is a particular speciality, and well worth trying. A recent development on the South Lakes scene, but also convenient for the West of Yorkshire, this coffee house serves delicious snacks and light meals, together with a whole host of goodies and sweet treats - and of course excellent coffee! But the delightful food is not the only attraction: the views are great, and the canal runs just a few yards away from the restaurant. This great place serves local food, lovingly prepared and attractively presented. Highly recommended. 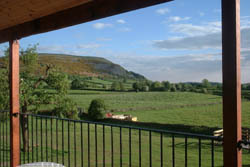 To find the Hideaway, travel from Junction 36 of the M6 along the A65 towards Kirkby Lonsdale. Go straight over Crooklands roundabout and the cafe is approximately 500 yards up the on the right hand side, less than one minute from the motorway. 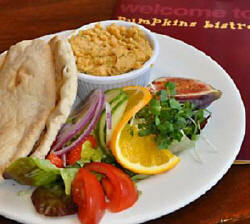 Pumpkins has a special emphasis on vegetarian food but they're also very happy to accommodate individual dietary requirements upon request. The restaurant is licensed and has a pleasant ambience enhanced by attractive artwork, some by a local artist, which gives it a Mediterranean feel. The menus are varied and very reasonably priced, all the food is sourced locally and the meat is predominately produced in Cumbria. Eggs are sourced from free range "happy hens", and they grow a considerable amount of the vegetables used during the summer months. Opening times are Monday to Wednesday 9.30am until 5.00pm and Thursday, Friday and Saturday 9.30am until 8.30pm. They even open other nights of the week for larger bookings (with the exception of Sundays). Phone 01539 728722 for reservations and enquiries. A super little bistro/restaurant, serving local food with a sharp contemporary edge. Good for vegetarians and fish lovers. It's got something of a reputation as the local "foodies" choice! The award-winning vegetarian Tapestry Tearooms provides an eclectic mix of delicious food to suit all tastes. In November 2007 the Tapestry Tearooms received the Vegetarian Society Award for "Best Provision for Vegetarians at a Visitor Attraction". 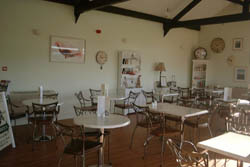 In May 2008 Cumbria Tourism awarded the Exhibition Centre & Tearooms "Small visitor Attraction of the Year 2008". Open all year Monday to Friday 10am - 4.30pm and some Saturdays. For all those chocoholics among you, the myriad of chocolate drinks and gateaux on sale here will keep you going for a fair while! A very long established and charming tea rooms associated with the tea and coffee merchants who've been in Kendal for a long, long time. And anyone who knows Kendal well probably knows Farrar's. In case you don't, suffice it to say that it's charming, with wooden floors and beamed ceilings (ancient ones! ), an old-fashioned place where you get table service with a wide choice of teas and coffees, breads, home-made soup, salads, pies and snacks. Busy, so be prepared to wait or go early to avoid the lunchtime rush. 13 Stricklandgate, Kendal town centre. Worth a visit for the farm shop selling organic and local produce - one of the biggest and best ranges you'll find in the North of England. But it also has a tea room, where you can get cakes, quiches, soups and salads, all of which are delicious. You can also see the cows being milked every day from 3.45pm. Very high quality fresh cakes, scones, soups, quiches, salads etc. Southbound side of A591 dual carriageway, 4 miles from Kendal. Staveley Mill Yard, Staveley village centre, 5 miles from Windermere off the A591 towards Kendal. Very good, vegetarian meals and snacks including falafels, sushi, kebabs, hummus, all kinds of salads, sandwiches and fresh cakes, and all at great prices! There's a Buddhist meditation centre upstairs, and you're made very welcome n the cafe. This is a really pleasant little spot, attached to Brantwood (but you can get in without visiting the house). You can enjoy delicious food, snacks and light meals while savouring the fantastic view over Coniston. Eastern side of Coniston Water, 2 miles from Coniston, off B5285 towards Hawkshead. For snacks, sandwiches and other tasty treats in a lovely spot by the lake. You can also learn more about Bluebird and the ill-fated water speed record attempt by Donald Campbell as you eat your delicious food, perhaps dreaming of ascending the Old Man of Coniston in the distance. Lake Road, Coniston, 0.5 mile south of town off the A593. Super modern café serving snacky type meals: you can get a great breakfast before you go off to the fells! Behind Windermere Railway Station on A591. On the terrace of this very special building, situated in one of the most desirable spots in the Lakes, the cafe serves coffees, cakes, lunches and more. The gardens are well worth a stroll, and the visitor centre itself gives an insight into the history and culture of the Lake District. Closed November to March. A reader emails: "Hi, Daryl's Cafe, at the foot of Orrest Head in Windermere has been run by Darryl for over 20 years, and is the earliest opening cafe in the area at 8 am (and he'll even open earlier for you on request! - how's that for service?) so you can get a big early breakfast before tackling the big mountains, and it is the only place that offers a left luggage service. 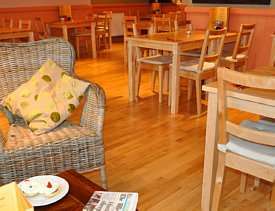 The cafe is only 100 metres from Windermere railway station." Here's an entry I found on a blog: "While looking for a place to have some dinner I found Daryl's, which is, in my opinion, the best cafe in the Lake District. It's just over the road and down the hill from Windermere train station on the opposite side of the A591 to the Windermere Hotel. It's a greasy spoon cafe that's cheap and cheerful with a menu consisting mainly of fried food, chips and soup. It's like time stopped a few decades ago and inflation seems to have passed over it as well. It cost me just over £2 to have a triple decker bacon and egg sandwich with tea. The cafe's well worth a visit, and conveniently it's open from 8 until 6 every day except on Sundays." Aha! My favourite Lake District cafe! We discovered it a few years ago after a cold, wintry walk around Loughrigg Tarn on New Year's eve, and it's never let us down since. The cakes are superb, the meals delicious, and the setting fantastic. Highly recommended. Skelwith Bridge, 2 miles from Ambleside on A593. With cinema, pizzeria, and cafe, this is a complete entertainment centre! The cafe is famous for its inventive veggie food - and everyone, including devoted meat eaters, will find something to tickle their tastebuds, for there's lots of choice to satisfy even the heartiest appetite. Highly recommended. Compston Road, Ambleside (on left of one-way street coming into town centre from Windermere). Very pleasant place - part bakery, with an enormous choice of pies, pastries, bread and so on, and part cafe, serving good, simple food. A great place to refuel after a walk. Rydal Road, Ambleside (on left of main road leaving town centre towards Grasmere). This is an especial favourite of ours, which we discovered a few years ago while staying at Lancrigg, the vegetarian hotel just up the road. We'd been walking all day and then came across Miller Howe, recently opened, on the edge of the Green in the centre of Grasmere, and enjoyed an unexpected and delightful lunch. We've been back many times since, and it always delights. They have a range of inventive and tempting main courses as well as snacks. A tiny room, decked out in jolly Provencal colours, serving baguettes, scones, tarts, sandwiches and homemade cakes. All of which are absolutely delicious! Highly recommended. Red Lion Square, centre of Grasmere Village, 3 miles from Ambleside, off A591. This stylish cafe, located in the car park in the centre of the village, serves breakfast from 9.00 then lunches and dinners, using locally sourced meats and fish. Highly recommended. One of the most welcome sights of my life was the warmly lit windows of Greystones in the distance as we came down off Helvellyn one winter's afternoon, frozen and wet. Hot chocolate and cake served to thaw us out and get us ready for the walk home! It's now been refurbished and improved, and served delicious snacks as well as more substantial food and excellent coffee and tea. Highly recommended. The contemporary cafe bar has reached Keswick, with this colourful and stylish cafe which serves lunch and dinner. It's a short menu but a reasonably wide ranging one, and the food is well-executed. Recommended. Pizza and pasta. Spaghetti. Simple, rustic food in a pleasant environment, for a filling, tasty meal and a pleasant evening out. Recommended. Lakeland walks for all ages and abilities.